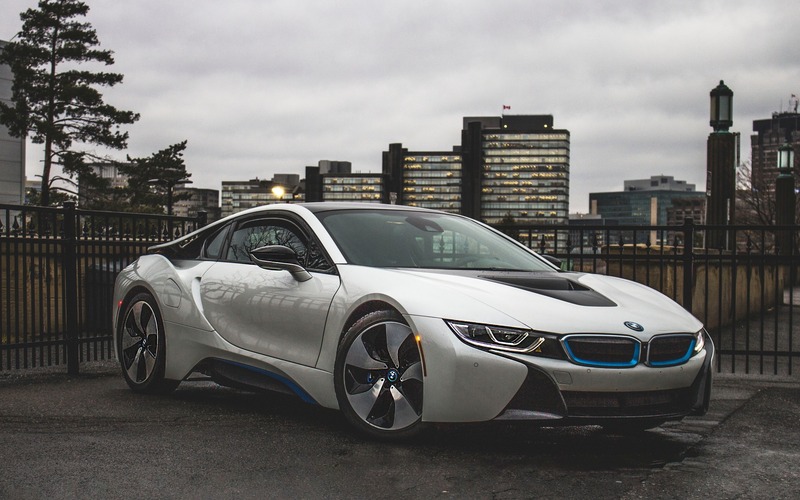 We’re quite familiar with the BMW i8 at The Car Guide, and so far, we’ve had mixed opinions. We called it a showcase, were impressed by its technology, and qualified it as a car of the future that’s available now. The i8 is a spectacular machine indeed; and yet, all of my colleagues have been left with a lukewarm impression, wondering who the car is targeted at with its astronomical price tag, and which cars it’s meant to compete against. Granted, if you’re looking for outright performance for your dollar, the i8 is easily outranked by a Chevrolet Corvette or a Nissan GT-R. But comparing this car to other sporting machines is missing the point, because it’s precisely not like anything else out there. Also: 2019 BMW i8 Roadster: It’s Here and It’s Beautiful! Instead, see the i8 as a statement about where we’ve come, and where we’re heading as far as mobility goes. And trust me when I say this, the future of the automobile is everything but boring. 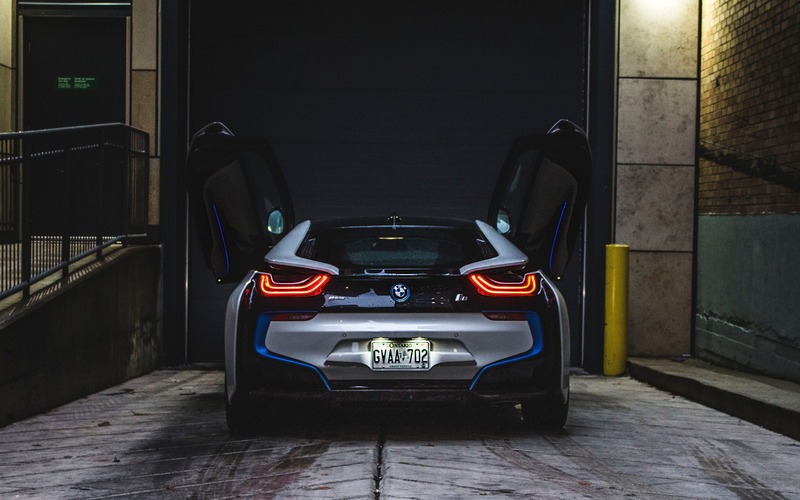 The i8 is proof that we can achieve much greater things without our dependence on fossil fuels. Earlier this month, we were at the Los Angeles Auto Show where an all-new roadster version of BMW’s hybrid supercar was unveiled. Convenient, considering L.A. is where the largest concentration of i8 sales has taken place so far. And BMW has been quite busy selling a lot of these things. For 2018, both hard and soft top cars will inherit a larger battery (from 7.1 to 11.6 kWh), which will increase range from 24 to 55 (coupe) and 53 (Roadster) km. There’s also a slight bump in total horsepower, from 357 to 369. The good news is that the rest remains unchanged. That also includes the radical “welcome to 2035” styling. Since BMW Canada currently has one of these bad boys sitting within its Montreal press fleet, and because this is possibly the most fitting machine for a congested city such as this one, I figured it made sense to take it for spin to see how this technological showcase stands two years after its birth. Saying the i8 looks the part is an understatement. Futuristic styling doesn’t always work on a car—some Japanese-brand designs are perfect examples of this—but I must say, the i8 is absolutely gorgeous from all angles. To understand the i8 isn’t to stare at its flying butresses or its spec sheet. It’s to spend some time with it in a congested city, and then drive out into the countryside. Montreal and its massive gridlocks is the perfect landscape. So I set out into the wild to see what’s what. Plug this thing into a quick-charge station, and it’ll get you up to 25 km of full electric range within the hour. Not enough you say? Well, according to BMW, that’s plenty for the average commuter that spends hours sitting in traffic. During that time, the supercar is front-wheel driven, where two AC motors, one fitted on each front wheel, propel the car in butter smooth serenity, with a surprisingly lofty amount of low-end torque generated from their combined 129 horsepower. Once the battery pack runs dry, the carbon-fibre racer suddenly becomes a conventional hybrid, similar to a Toyota Prius. That’s when the 228-horsepower, turbocharged 1.5-litre three cylinder—yes, three—gasoline engine kicks in, along with another tiny electric motor. They all work in unison to help transport you away from urban chaos to the tune of a 6.5 L/100 km combined consumption average. Finally, there’s a Sport mode, and that’s where things become truly interesting. To activate it, you need to push the six-speed automatic gearbox’s lever to the left. The instrument cluster suddenly turns red, and at that point all four motors are running full swing, pumping out a grand total of 357 horsepower (369 for the 2018 model). The car is now all-wheel driven, and acceleration from 0 to 100 km/h is claimed at roughly 4.2 seconds, about the same as a Ford Mustang Shelby GT350. Oh, also, Sport mode recharges the batteries! How cool is that? 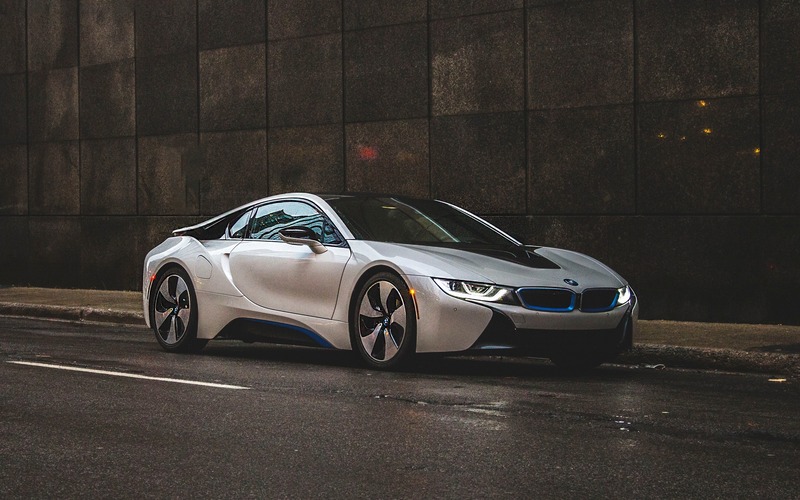 Stomp the i8’s accelerator in the high gears at low speeds, and the ultra-light body surges forward with anticipated vigor thanks to the massive torque generated from the electric motors and the gas engine’s turbo boost. The sounds emitted from behind your ears could have very well been copy/pasted off the Millennium Falcon for all I care. The i8 sounds cool as heck. Downshift a few gears from the steering wheel-mounted paddle shifters, and that little three-pot blips the throttle, emitting a solid blurp, amplified through the Harman Kardon speakers. Hit the go pedal, and the futuristic machine picks up and goes in a jiffy, no hesitation, climbing the tachometer in absolute urgency, sounding totally organic, feeling absolutely analog, and converting what should be a complex and digitalized experience into a mind-blowingly fun and tactile event. Do I care that the sounds I’m hearing are fake? I do not. On the road, the i8 is immensely quiet and surprisingly comfortable. The ultra-rigid carbon fibre structure allowed BMW engineers to fit the car with a rather soft suspension, giving it a compliant ride over the rough stuff without the traditional chassis flex or unwanted cabin rattles typically attributed to sports cars. The front seats are comfortable; the rear ones don’t really exist, neither does the trunk. Visibility is impeccable for a car like this, but that slanted rear glass does have a habit of distorting oncoming objects. The i8’s cabin is in tune with its exterior design, with swooping lines, blue lighting and a futuristic gauge pod that resembles something straight out of a fighter jet. 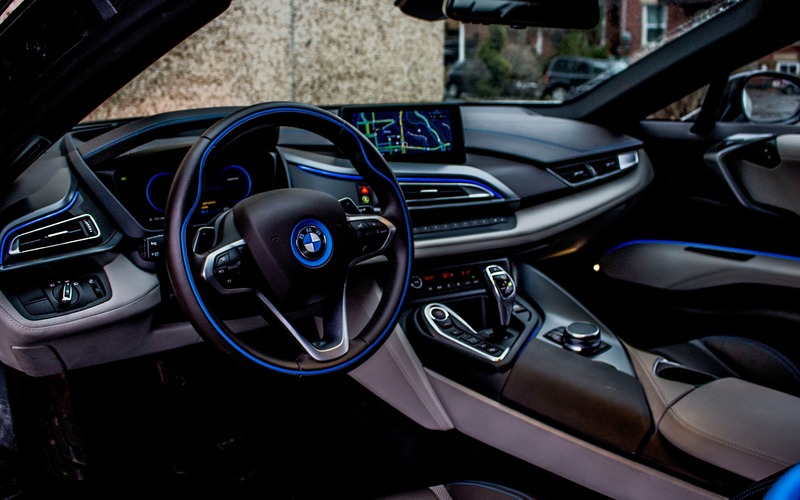 The i8 gets a bespoked version of BMW’s iDrive interface. The menus are clean, attractive and easy to comprehend. The software is quick to react from the centre-mounted knob dial, the screen itself is wide and elegant, but as with everything BMW these days, there’s a layer of complexity in this infotainment system that we could do without. Shortcomings? Oh, yes. Several interior materials are plastic-intensive, especially for a car of this price. Some switchgear seems to have been taken straight out of a 3 Series, which contrasts the cabin’s overall design. Those doors make parking in a crowded space a challenge. Good luck getting out of it looking smooth. The three-cylinder engine sounds rough on idle, especially during cold starts where the entire car shakes from the beat of its firing order. And handling is not exactly supercar brisk. Sure, the low centre of gravity, wide stance and light weight do mean the i8 can attack a corner quickly, but the low-resistance tires and heavy hybrid drivetrain mean the car will understeer undesirably when attacking apexes the way a supercar should. That all being said, the fun factor hasn’t been sacrificed. 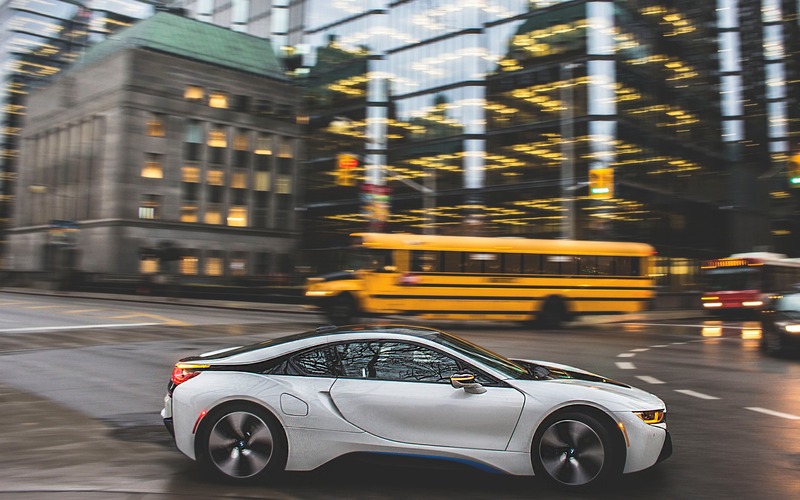 The i8 is every bit a BMW, and the steering remains telepathically precise. Besides, most drivers will never push this car on a racetrack anyway. Bavaria’s mid-engine supercar may be outpaced by cheaper performers, but no other car offers this much bling, this much tech, and this much of a window to the future of the automobile at this price. 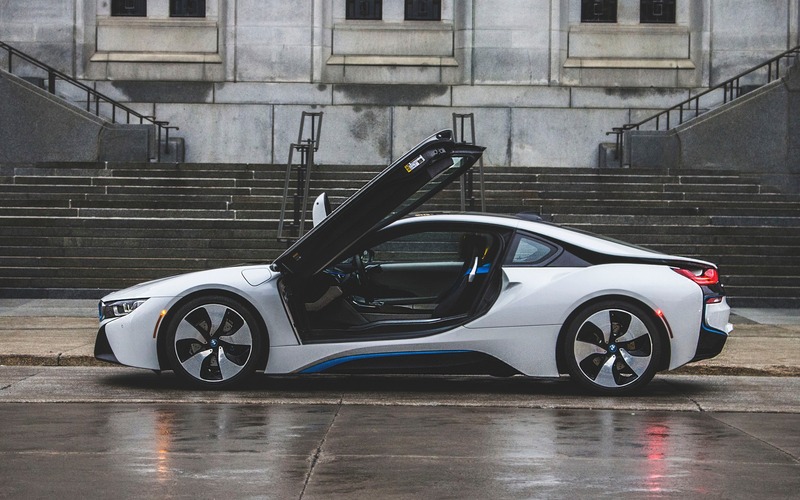 If you can afford it and seek something unique and unquestionably cool, the BMW i8 is definitely worth the shot. 10/10	We observed a 6.4L/100 km average. In some cases, the car burns no fuel at all. For a supercar, that's spectacular. 7/10	The front seats are comfortable and supportive, but good luck fitting in the back seats. 6/10	The car is quick off the line and will generate a lot of g's in the bends, but there are better performing cars for way less money. 6/10	iDrive is elegant and easy to use, but the learning curve remains steep. 8/10	Quick steering, enjoyable sounds, solid handling, the i8 is as fun to drive as any other gas-powered BMW sports car. 8/10	A quick, nimble and fun-to-drive technological showcase that remains analog even with all the complicated tech sitting underneath its carbon-fibre shell. LISBON, Portugal – It was a fantastic idea to unveil the sporty and dynamic version of BMW’s electric compact in the Portuguese capital. A wonderful city, some 2000 years old, Lisbon has a hilly historic centre with winding interconnected alleys that are barely wider than a small car’s sideview mirrors.